Consider this advice before building on the foundation and embarking on the excavation. Before the building of an addition can begin, site preparation may be necessary. Are there any garden plants, shrubs, or other vegetation you want to remove and set safely aside for later replanting? If there’s a tree in the way, you’ll need to arrange for its removal. Any other obstacles to the process—an old patio, say, or a stack of fire­wood—must be moved out of range before work can begin. Depending upon where the work is to be done with respect to the street, additional preparation may be required to clear a path for the equipment and materials to reach the work site. If you’re building a large addition, the arrival of a surveyor may signal ground will soon be broken. With a smaller job, your designer or contractor will probably begin the process by marking out the extent of the new, enlarged footprint of the house. The plot plan will guide whoever it is that does the staking out. For a large project, a transit will be used, an instrument that establishes elevations and levels and points, to help precisely locate where the new excavation is to be done. When the staking out is completed, there will probably be stakes and connecting strings that mark where the excavation is to be done. Perhaps lines of lime will criss­cross the ground, extending beyond the actual location of the foundation or cellar hole to guide the men with the earth-moving machines. Don’t faint dead away upon seeing the plot staked out. Even large structures can seem diminutive when reduced to strings or lime lines struck across the ground and viewed under the canopy of the sky. Your new, expensive, and carefully imagined space may suddenly seem rather small. So prepare yourself. After you’ve managed to keep your cool on first look, take a second and closer peek. It probably makes sense for you to extend your tape measure from comer to comer. Think of it as a warm-up exercise for the job to come. Your purpose is to make sure the new foundation abuts the old structure where it’s supposed to be and oth­erwise matches the plan. Now the noise can begin. Diesel-powered earth-moving machines arrive a day or so later. Often a back hoe will be enough, though for big jobs there may be a bulldozer (call it a ‘dozer) with a wide blade. Or an excavator, a descendent of the steam shovel, with its long arm and the bucket at the end. None of these machines move quickly; they weren’t built for speed. But they’ll shift gargantuan quantities of soil and, if necessary, tree stumps and miscellaneous boulders. They will leave you with a foundation hole dug to a depth of at least six inches below the frost line. The frost line is the depth to which the winter frost penetrates the earth. In the northern United States, that means the foundation must be at least 3 or even 4 feet below grade; in southern regions where subfieezing tempeiatures are rare, the foundation may virtually sit on the surface. The base or “footing” of a foundation must be beneath the frost line to prevent the frost from thrusting portions of your founda­tion upward and causing your house to settle unevenly (which would result in cracks in the foundation and, eventually, cracks and other damage upstairs in your home). The deeper frost lines in northern areas are one explanation for why full basements are more common there. The potential problems during the excavation process are too many rocks (if it’s solid ledge, blasting may be required); too much water (an underground stream or spring may require special drainage); or even soil problems. Some soils simply aren’t firm enough to bear the weight of a structure without additional support, typ­ically an enlarged concrete footing (see below). In parts of the country where soil problems are common, your designer or architect will probably have suggested you test it in advance. Speaking of soil problems, you may need to protect the soil you have. You may even be required to construct fences, stake hay bales, or employ other means to pre­vent soil erosion in the event of a heavy rain. The walls come next (after the concrete sets, which takes an average of three to five days). The wall may be of cement block or of concrete poured into a wooden form that is removed after the concrete has set. 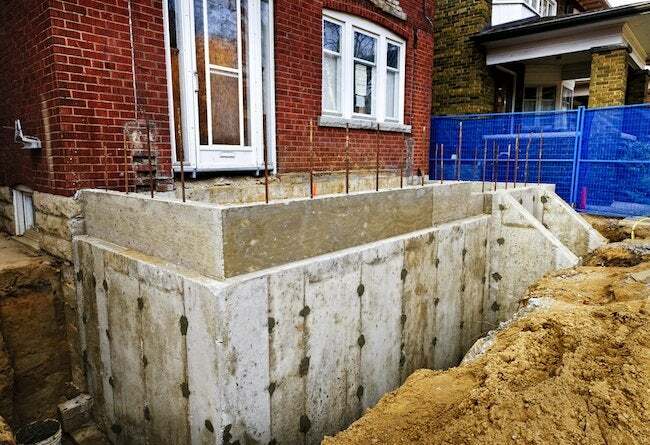 Setting up the forms for a poured foundation will take a portion of a day; the forms will be stripped two or three days later. Stone foundations are almost unheard of these days, though for aesthetic rea­sons some concrete foundations are built with a small shelf set into the portion of the foundation that will be above grade (i.e., not buried) onto which a veneer of brick or stone can be laid to hide the less attractive concrete. After the concrete forms have been removed, perforated piping (called drain tile) is laid outside the wall at its base in damp climates. These pipes will be pitched to allow the water that enters them to drain off and away from the foundation. The earthmoving equipment will then return and backfill around the cellar hole. The soil on the surface must be graded so that when there is rain the water will naturally flow away from the house rather than into its foundation. Done by a bull­dozer or other earthmoving machinery, this work is called cutting and filling, as the blade of the ‘dozer serves to cut off the tops of the high spots and fill in the low ones. If you are planning on landscaping work later, now is the time to give the yard at least an approximate shape while the heavy equipment is there filling in around the cellar hole. The foundation won’t be completed in day; a week or two to complete the various steps is usual. But once your foundation is ready, the carpenters can begin their work.